USD traders have returned to the market after the long weekend. 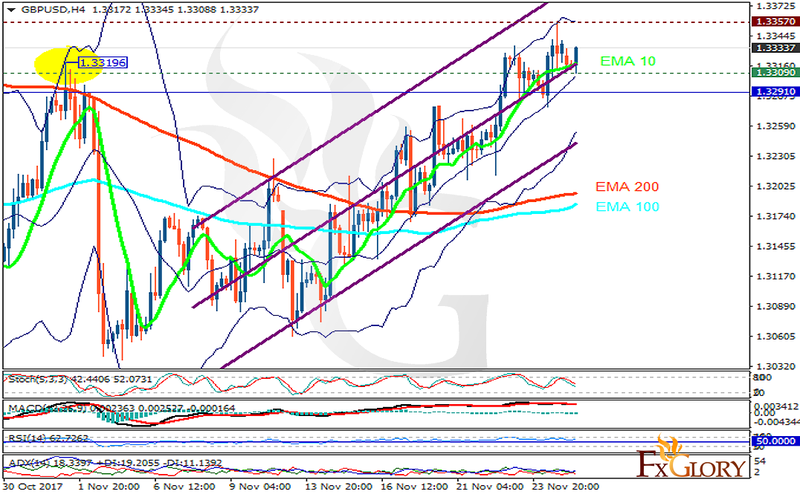 The support rests at 1.33090 with resistance at 1.33570 which both lines are above the weekly pivot point at 1.32910. The EMA of 10 is moving with bullish bias along the ascendant channel and it is above the EMA of 200 and the EMA of 100. The RSI is rising towards the overbought area, the Stochastic is showing downward momentum and MACD line is below the signal line in the neutral territory. The ADX is showing buy signals. The price is moving in upper Bollinger band and it might decline at any time but traders can open buy orders and target 1.3440.